Besides writing for Ballpark Digest, Jesse Goldberg-Strassler tackled a big offseason project for the Lansing Lugnuts (Low Class A; Midwest League): launching a Michigan Baseball Hall of Fame. Here’s his account of the experience. The offseason is the proper time to introduce a Hall of Fame. The thick of the baseball season is necessarily preoccupied with the present, promoting the current stars, and the future, highlighting the big nights coming up and looking forward to postseason chances. The offseason is very much about the future, too, but it allows us time away from the on-field play to think about both the past, shown in the BBWAA’s announcement of the latest Cooperstown inductees and the thoughts shared following the recent passing of Ernie Banks. The offseason is also the proper time for a significant announcement, and there’s nothing like the words Hall of Fame to carry significance in baseball fandom. Last August, I was asked to lead a project to establish a Michigan Baseball Hall of Fame. On Wednesday morning, the Michigan Baseball Hall of Fame was officially announced at Cooley Law School Stadium. In the immediacy of learning of the Hall of Fame project last August, I did not understand the project’s true breadth. I had been placed at the threshold of a mansion; I saw only a foyer. It was decided, properly, that an eligible candidate could be all of the above. I began a painstaking list of all the notable players who had come out of Michigan-based universities (hello, Jim Kaat! ); adding in any Michigander who had made it into the Baseball Hall of Fame; and giving special notice to anyone else I could find who had carved out a big-league career from the Great Lakes State. But we could go even farther. Storied Michigan high-school coaches deserved mention, as did executives, scouts, and any other longtime contributors to the game. Baseball is a local game, played on nearby fields. Its heroes are also local, forging a personal link with us. From the fans’ choices — since we cannot enshrine them all — a nine-member Michigan Baseball Experts committee was selected, invited, and compiled, reflecting generations and range of baseball knowledge. That committee includes an umpire and administrator, a scout, two head coaches, two sports anchors, and three broadcasters, with experience at every level, SABR credentials, and memories dating back, in the case of former Tigers broadcaster Paul Carey, to the late 1930s. This was one side to creating the Michigan Baseball Hall of Fame. Concurrently, there was the copyright to be secured through the help of Minor League Baseball, and bylaws to be organized, officially recognizing authorization, eligibility, method of election, and time of election — our framework to support the mansion. A timeline and critical path was developed, with important dates secured while working in reverse: Inauguration Day / Hall of Fame Weekend, the Announcement of Inductees, the Voting Period, and, firstly, the Announcement of the Hall of Fame itself, this past Wednesday. Now off we go, on our way to Hall of Fame Saturday, June 27th. For anyone interested in establish his/her own Hall of Fame, I offer encouragement. Figuring out the particulars of the process, specifying who is eligible and how they will be inducted, is worth it. From August until today, I have enjoyed an overriding and affirming takeaway: The idea of a Michigan Baseball Hall of Fame gave a smile to everyone who learned about it. We experience exhilaration in celebrating baseball’s present, whooping to the heavens following a late-inning home run. But there is a special kind of shared happiness in celebrating baseball’s past, from generation to generation, honoring heroes and passing down their exploits. This article originally appeared in the weekly Ballpark Digest newsletter. Are you a subscriber? If not, sign up here for free! 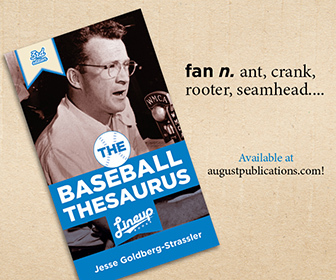 Jesse Goldberg-Strassler is the Voice of the Lugnuts and the author of The Baseball Thesaurus from August Publications. A new mindset in Oakland?